Totana.net - The Socialist Municipal Group has introduced several initiatives "beneficial to totaneros"
The Socialist Municipal Group has introduced several initiatives "beneficial to totaneros"
Socialist councilors have reported motions presented information to committees and have not been supported by the popular government in the agenda of the plenary to be held this Thursday. Report from the PSOE totanero have filed several motions of great interest to our people and its citizens, but they say "it seems that the PP does not want to be discussed at the regular full month of June." The first motion is socialist returning totanero according to the PSOE, the council should do the fees charged to citizens and, according to the law reports available to the PSOE, "have been adopted in violation of the law." A motion proposing the adoption of full fees is the representative body of all totaneros and which has the task of approving such charges. Another motion of the Socialist group intends to alleviate the tax burden of many totaneros, cutting 95% of the vehicle tax, the "seal." Of this reduction as the Socialists would benefit both the public and traders. Also arise from the PSOE de Totana create a commission to monitor the works of Zapatero Plan, "which has led to our town an investment from the central government of 5,087,000 euros." The commission proposed by the Socialists would consist of representatives of three political groups and municipal technicians, and be responsible for assessing the effects of this investment has been important Totana, especially with regard to employment generation was the main reason its implementation. "The People's Government seems to be interested in checking the results of that plan in our people," they say. 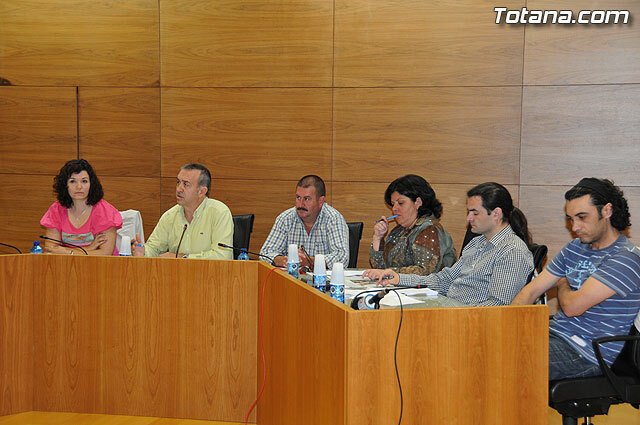 The Socialist Party has also filed a motion which includes a claim that comes from years ago: the creation of a Center for Adult Education Totana, Alhama without administrative unit as now occurs, which hinders their development, and providing it with more resources human and material so that it can provide the best service totaneros. The Socialist motion calls a meeting with officials of the Autonomous Region which is the one with the mandate, but according to reports from the PSOE municipal government People's Party is only interested in asking when Madrid Murcia but not, lest Valcárcel be that still does not return the greeting that the mayor withdrew. " On the other hand it will be discussed in the full two motions filed by the Socialists, one of them on the road repair of the Vines, the deterioration of improvements as required to support traffic that passes through the area and both crops such as residence, and another motion to urge the regional administration once it reaches full implementation by all the Dependency Act passed by the Zapatero government, to help families with dependents in their care. Finally, from the Socialist Party announced that it has filed a joint motion of the three political groups to adopt a manifesto in defense of the Tajo-Segura and platform support local constituted for that purpose.